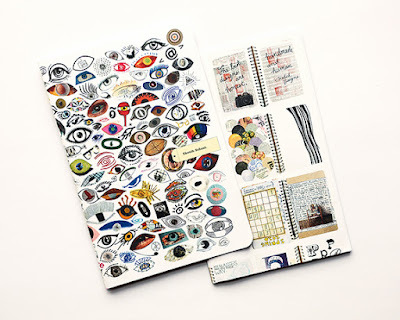 Sketch School (carolsogard.com) is a nicely designed, compact zine by Carol Sogard (carolsogard.com), a designer, zine-author, artist, and educator at the University of Utah Department of Art and Art History, and her students. As summarized at the website for the international design competition cause-affect.org, "The purpose of this piece is to inspire creativity through evaluating students' sketchbooks." The zine and its accompanying poster include pages from student sketchbooks which are used to illustrate creative exercises that anyone can use to explore new ideas. This is another gem I found at Needles & Pens (needles-pens.com), a San Francisco zine shop on Valencia which is full of tiny doses of good ideas in the form of zines. Sketching and drawing have returned to design prominence in the last few years. When I was in architecture school (back in the stone age), no one was sure what non-technical drawings would ever be used for, since illustration was dominated almost completely by technical drawings and photography. A backlash against digital representation has gradually made people appreciate the imperfections and personality of freehand drawing again. The only problem is that people believe they "can't draw," and so need to be encouraged to try this delightful activity. This zine effectively and delightfully services this purpose. It is worth visiting Carol Sogard's site separately, to see her environmentally informed art installations and publications, and to see opportunities to attend her Sketch School sessions in the future.